Planting new trees in the landscape now ensures their benefit to and enjoyment by future generations. 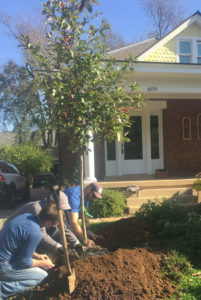 Proper tree selection and planting practices are essential for the health and longevity of any new tree in the landscape. Planting new, young trees in the landscape is a welcome change from the usual day-to-day, high-angle labor of working aloft. We recommend replacement for each tree we remove to preserve our urban canopy. We take great care in selecting healthy, high quality trees from Lexington’s nurseries and we promote the planting of species native to the region in order to benefit local ecosystems and increase biodiversity. Our arborists are happy to assist with choosing the perfect tree for your property. “The arborist was very knowledgeable and helpful in making decisions of how much work was really needed. His main concern was the health of the trees and doing the work that was needed to keep them healthy. Our work was slightly delayed due to several bird’s nests and an owl taking up residence in one of the trees – and we were thrilled that the needs of the wildlife that we love were respected.